LOS ANGELES, CA, November 10, 2014 — Through his career in music and beyond, Niko Bolas has had many roles: producer, engineer, mixer, technologist, consultant, entrepreneur and so on. The list of artists he’s worked with is long and varied: Melissa Etheridge, Warren Zevon, Kiss, Rod Stewart, Barbra Streisand, Billy Joel, Fiona Apple, Toto, Tracy Chapman, The Jacksons, John Mayer (for his contribution to Disney/Pixar’s Cars), Disney’s Frozen: The Songs, Demi Lovato, The Mavericks, OneRepublic, Zedd and scores of others. But his closest association is very likely with Neil Young; Bolas has been producer and/or engineer on a dozen or so of Young’s LP’s over the last three decades, including Freedom (1989), Ragged Glory (1990), Living With War (2006) and several others. An artist as driven, restless and prone to creative detours as Young is thrives with a sympathetic collaborator, and Bolas has proudly served as such for the mercurial songwriter on and off since the mid-1980s. The latest chapter of this collaboration is Young’s most recent release Storytone, for which Bolas and Young share producer credit. The second full-length from Young in 2014 (after the lo-fi covers LP A Letter Home earlier this year), Storytone actually exists in multiple incarnations. The deluxe edition’s first disc contains the version that was recorded first – beautiful and simple solo renditions featuring solely Young singing and playing an instrument. This bare-bones document stands on its own quite successfully, but it also doubled as worktapes for some serious arrangers to do their thing. As Young toured with Crazy Horse, Bolas worked with arrangers Michael Bearden and Chris Walden to create fully fleshed-out approaches to the songs, integrating orchestral and big-band arrangements. When Young was ready to come back into the studio, an entirely new version of the album was well on its way to completion. Although Young’s records have featured lush orchestration before (notably on his 1972 classic Harvest), Bolas took this opportunity to encourage a set of new approaches in Young’s singing style – drawing upon croonerism and unique phrasing that breaks from anything released by Young in his decades-long career. Both standard and deluxe editions of Storytone are now available from Reprise Records. 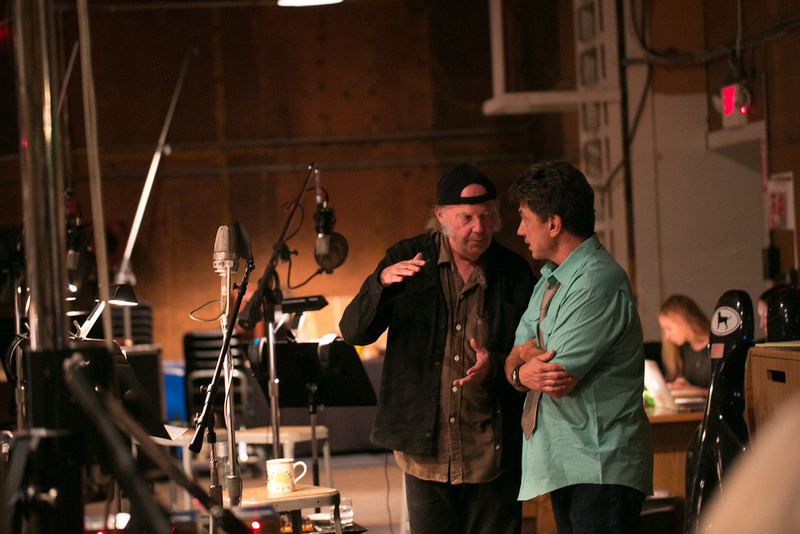 Photo Caption: Neil Young and producer Niko Bolas, in the studio recording Young’s vocals for the new LP Storytone. Photos by Chris Schmitt.